We have received generous grant support from the Vermont Arts Council for our TLC project to go statewide! VAE has built a reputation over almost 25 years of turning trash into treasure and has therefore become a depository for strange and unusual items. One donation years ago showed up in the form of over 50 plaster molds. These included baby doll parts: round plump heads, angelic arms, and chubby legs. Various objects and sculptures were created with these, all reminiscent of Tim Burton’s Gothic world, until the molds found another purpose. Within a ceramics class, VAE teaching artist Kristen Blaker and the residents at the Vermont School for Girls (VSG) actually started making dolls; clay was pressed into the molds, parts were fired and faces delicately painted. The assembly of hand-sewn and stuffed bodies came into play as wigs, bonnets, and dresses were made. Lovely dolls came to life. Kristen talked to the girls about the concept of “giving back” and donating the dolls to Project Against Violent Encounters, the local women’s crisis center, that could give the dolls to a child in crisis. Realizing that while the ceramic dolls were beautiful pieces of art, they were also very breakable so Kristen and the girls decided to make dolls entirely out of soft and comforting fabric and stuffing to give to kids in crisis. 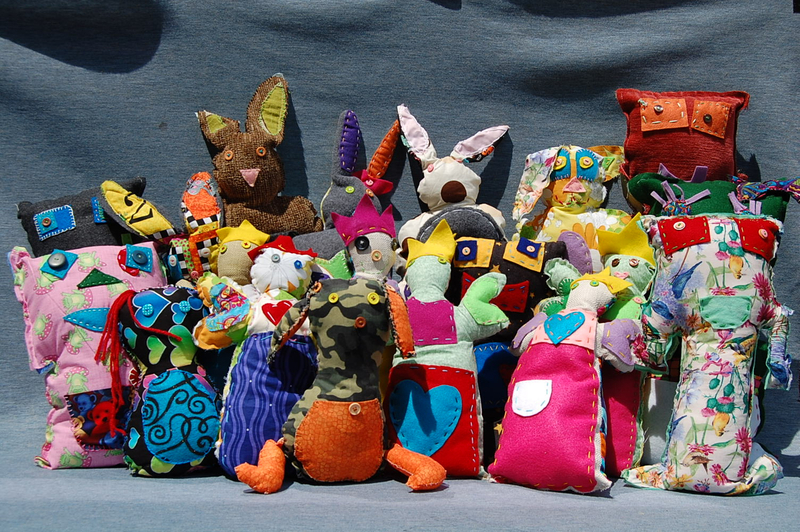 Excitement grew with the idea that the sewn and stuffed creations would be in the hands of a child in time of need. The girls decided to name each doll and write a personal letter to the child, tucked into a pocket. The girls from VSG, many who suffer the effects of severe emotional trauma, were suddenly immersed in work that was not just healing for others but brought great reward to themselves. They were also are learning skills and techniques in the process of making, measuring, cutting and sewing the dolls, rebuilding themselves and becoming a positive influence as they contributed something valuable to their community. The TLC Project was born! While the girls at VSG will continue to create TLCs, we need a volunteer sewing brigade to help them reach our goal of completing 800 TLCs by the summer of 2019. We will provide you with instructions and supplies, you will sew away at home! Click here to join our volunteer sewing brigade. and neutral soft fabric no smaller than 8″ x 14″. Click here to donate from our supply list. to help us purchase the needed supplies. Click here to donate financial support to the TLC project. Feel free to contact us with any other questions about this exciting endeavor!